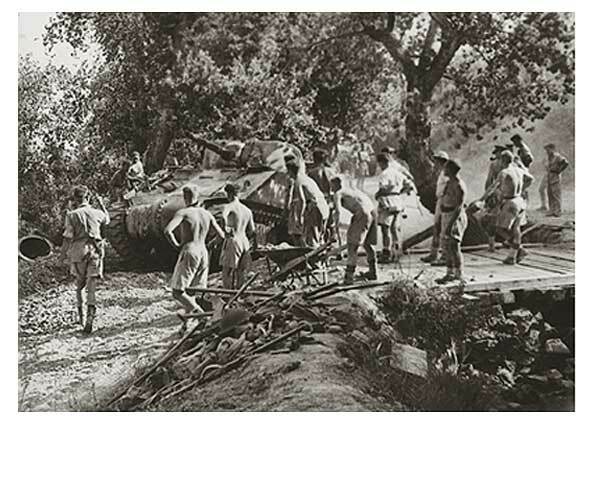 Canadian Tanks in Sicily, n.d.
Dust, heat, poor roads, and difficult terrain were some of the main obstacles that the Canadian army faced during the Sicilian campaign. Once Erwin Rommel's North African forces had been defeated in the spring of 1943, the Allies again attempted to invade Fortress Europe. They prepared for another amphibious landing, not in western Europe, as they had done in 1942, but on the Mediterranean island of Sicily. The decision seemed to be a sound one as Sicily fell relatively quickly. The victorious Allied divisions included the 1st Canadian Division with the 1st Canadian Army Tank Brigade under the command of Major-General Guy Simonds. The Allies targeted the south and southwest coasts of the island. 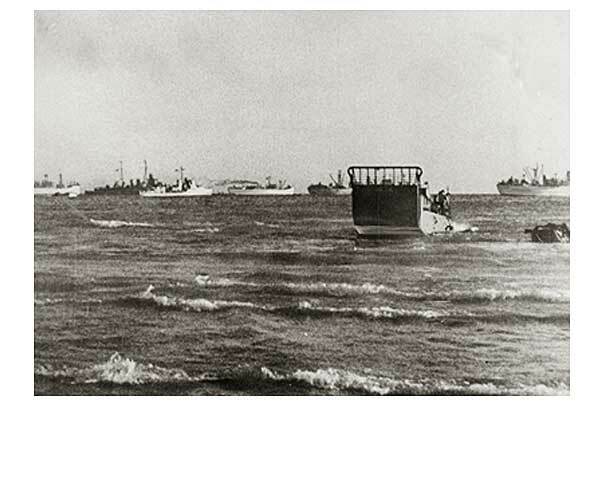 On 10 July 1943, the Americans landed between Scoglitti and Licata, while the Canadians and the British made their amphibious assaults between Pachino and Syracuse. 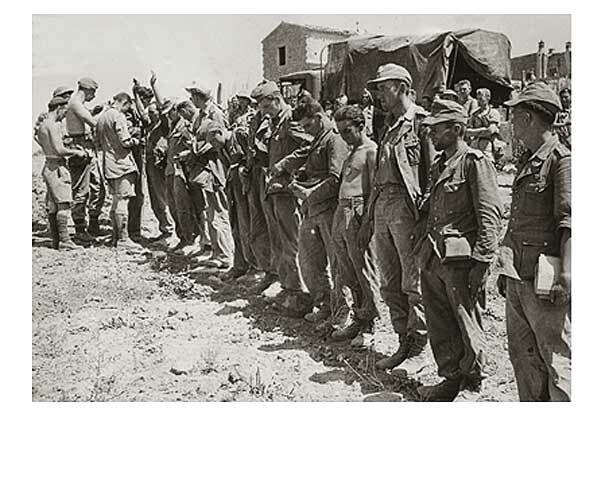 Encountering slight resistance from the Italians, the Canadians moved north through Ragusa and Vizzini and reached Piazza Armerina by 16 July. 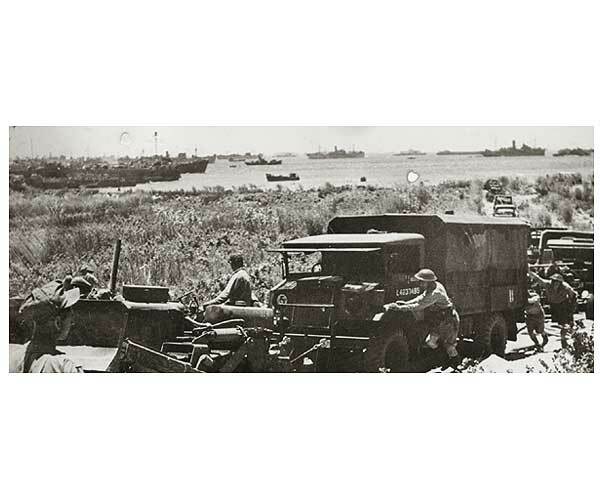 In the early stages of the campaign, dust, heat, and poor roads were the greatest encumbrance the Canadians faced. By mid-July, however, German troops had bolstered the ranks of the ill-equipped and ineffective Italian army. Commanders Take Refuge from the Heat, Italy, n.d.
General Bernard Montgomery, British 8th Army, and Major-General Guy Granville Simmonds, 1st Canadian Division, find a shady spot to discuss operations. 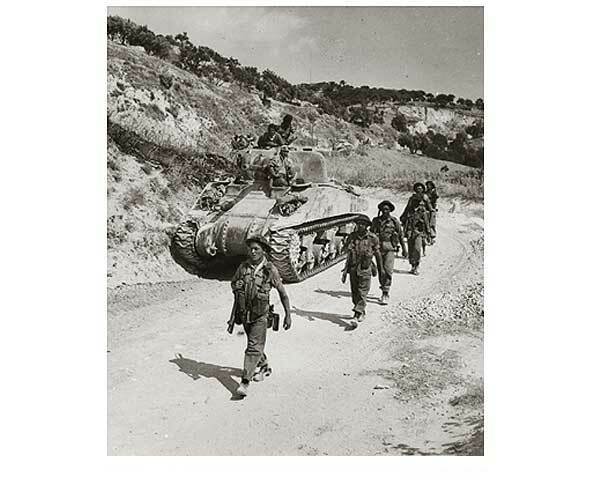 After a stiff fight against German defenders, the Canadians took Piazza Armerina, a town in central Sicily, on 17 July. The next Canadian objective, Valguarnera, lay a few miles to the north. Once again, the battle for the town was difficult and costly: the Canadian division suffered 40 killed and 105 wounded. 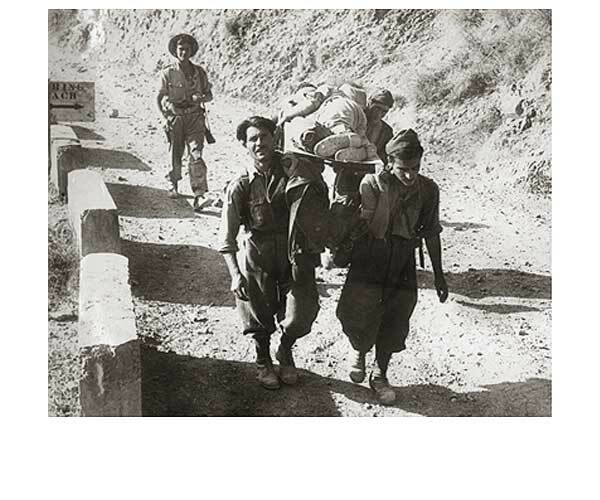 Stubborn German resistance and uneven terrain also made taking Leonforte and Assoro difficult assignments. At Assoro Ridge, the Hastings and Prince Edward Regiment scaled precipitous cliffs, a task that the Germans had considered impossible. Once the regiment had established a defensive perimeter with a clear view of the German defences, it directed artillery fire onto the enemy positions while fending off several determined German attacks. Montgomery's Eighth Army resumed its advance. Canadian Gunners in Sicily, n.d.
An artillery crew loads shells in preparation for a bombardment. The Canadians faced another formidable obstacle at Leonforte. The German defenders had destroyed the only bridge into the town, but The Loyal Edmonton Regiment (1) (LER) negotiated the rocky ravine and pushed onward. In bitter hand-to-hand fighting, the LER managed to oust the Germans and force its way into the centre of the town. The German defenders, reinforced with tanks and additional troops, counterattacked and encircled the Canadians. Throughout the night, the savage fighting continued, and the brigade commander, Chris Vokes, was certain that the LER had been wiped out. However, a young Italian boy, bearing an urgent message from Lieutenant-Colonel Jefferson of the LER, managed to avoid German patrols and reach the Canadian brigade. The next morning, Canadian engineers hastily constructed a temporary bridge over the ravine. The Princess Patricia's Canadian Light Infantry and tanks of the Trois Rivières Regiment charged into Leonforte. After bitter fighting, they reached the beleaguered LER, and, by the end of the day, the town was in Canadian hands. Canadian Snipers in Sicily, n.d.
Two snipers fire at the enemy through the smoke of the battlefield. At Agira, Simond's military barrage looked impressive but missed crucial German targets. The Canadians won the battle only after several air attacks and bitter hand-to-hand combat. 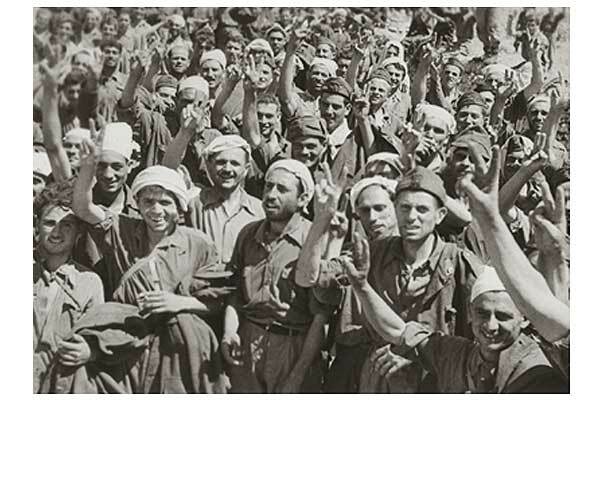 They captured their next objective, Regalbuto, on 2 August. 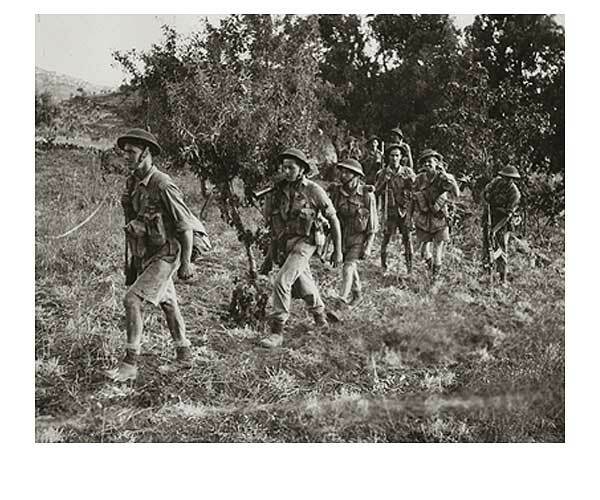 Four days later, they took Adrano, their final engagement before the 27-day Sicilian campaign ended. The Sicilian campaign had gone well for the Canadians. The Canadian division had fought some costly battles, however, with 562 men killed, 1,664 wounded, and 84 taken prisoner in the course of its 130-mile advance. 1. King George VI granted the epithet "Loyal" to The Edmonton Regiment on 7 July 1943, but the regiment did not learn of this honour until 31 October 1943.